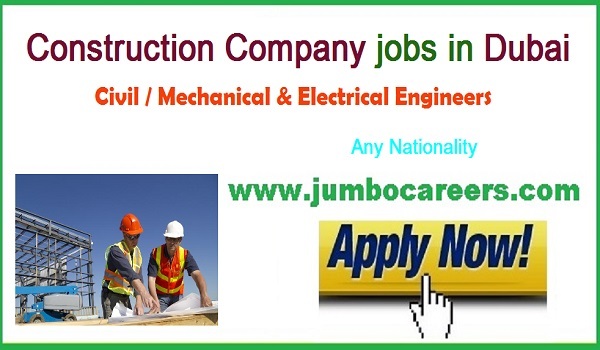 A leading construction company based at Dubai- Fast Service Electro Mechanical Works LLC hiring experienced Electrical, Mechanical and Civil Engineers for Dubai. We are currently looking for a Civil/Mechanical Engineer and Electrical Engineer holding a Bachelor Degree who can join us immediately. • With at least not less than 7 years of working experience in construction industry in UAE in the Contracting and Fit-Out Maintenance. – Managing of Sites and ensuring that the project will be completed on time. – Preparation of Submittals, Time Schedules and Project Documents. – Coordinate between Clients, Sub-Contractors and Needed Authorities. – Supervision of Sub-Contractors, Quality and Material Control of all items, including stage wise inspection up to completion. – Arrangement of Material, Equipment, Labors and Management of Site. – Holding Progress Meetings on Site with our Clients, Suppliers and Sub-Contractors. How to apply for BE/ B tech Engineer Jobs in Dubai?